Smash these blue Popcats to get at the bounty of Focus prizes inside. Invigorating! 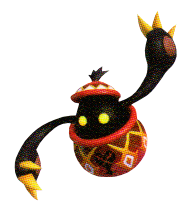 The Focus Popcat is a Heartless that appears in Kingdom Hearts III. This page was last edited on 3 April 2019, at 17:26.